Support Public Lands! Support Musicians! The average Songscape costs $6,000 which includes recording studio fees, videographer fees, band travel, and album artwork. Because our nonprofit is new and operating lean, we don't have staff or rent to pay. All of your donation goes towards supporting Songscapes. It's super important now to promote public lands- they're under threat by movements in Congress to turn federal public lands over to private control. One of the best things about being an American is that we are all owners of beautiful lands across the entire country. Help us build support and love for public lands, to ensure that we remain public land owners forever! Music is an especially strong way of building support for public lands. It reaches across generations, cultures, and geographies to grab people in an emotional way. The environmental movement is not making headway or building allies by touting guilt and too many statistics. Songscapes reach people in an innovative, celebratory, beautiful way. Let's inspire listeners and viewers to visit and value these public lands! Your support allows Songscapes and transformations to happen! Currently we're raising funds to support Songscape: Bear River Migratory Bird Refuge. 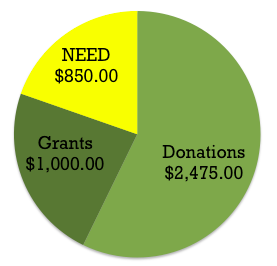 We still need $850 from a total cost of $4,325.